This year the focus in the studio is to offer new projects and new workshops and this August we roll out the new Black Cat Workshop. Two classes available, one in the evening and the other is an afternoon workshop. Registration is first come first serve and a reminder that the workshop may not be repeated this year, it depends on the interest and participation. I have been wanting to do a black cat project for a number of years and finally got around to making it happen. 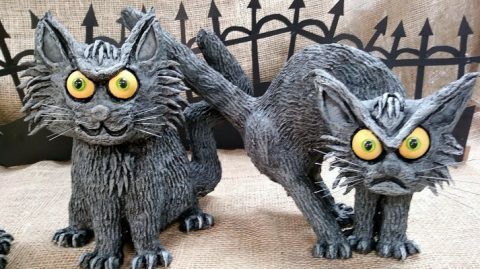 The feisty felines stand about 12 inches tall and are created with two different papier mache techniques. The first night of class you will design the shape of the head, body and tail and put your cat in your favorite pose. After the design work is done we use homemade paper clay to sculpt and create all the fun details. 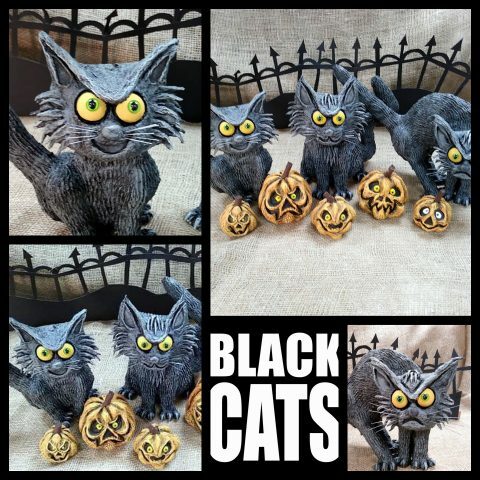 Before you ask, no, you do not have to paint your cat black…you can choose whatever color scheme you desire, I went with black to make them Halloween appropriate. This is a fun workshop and everyone’s cat will be their own vision. The armature technique used for this project is unique and not used in any of our other workshops. 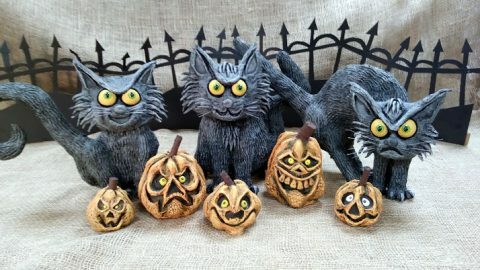 If you would like to sign up for a workshop please send an email to stolloween@gmail.com with the name and time of the workshop in the subject line. Class size is limited to eight seats.